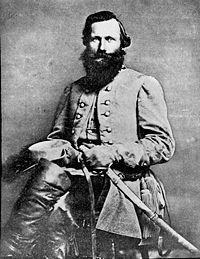 James Ewell "Jeb" Brown Stuart (February 6, 1833 – May 12, 1864) was an American soldier from Virginia and a Confederate States Army general during the American Civil War. He was known to his friends as "Jeb." Stuart was a cavalry commander known for his mastery of reconnaissance and the use of cavalry in offensive operations. While he cultivated a colorful and cavalier image (red-lined gray cape, yellow sash, hat cocked to the side with a peacock feather, red flower in his lapel, often sporting cologne), his military skill made him Robert E. Lee's eyes and ears. Like his fellow Virginian and commander-in-chief, he decided to fight for the South when Virginia joined the Confederacy. He is considered to have been one of history's greatest Cavalry commanders. His reputation and exploits helped inspire Southern morale, enabling the retention of some pride and dignity in the face of their defeat. He was killed in May 1864, during the Overland Campaign, at the Battle of Yellow Tavern. James Ewell Brown Stuart was born at Laurel Hill, a plantation in Patrick County, Virginia, near the Virginia/North Carolina border on February 6, 1833. His father, Archibald Stuart, was a politician and attorney, and represented Patrick County in both houses of the Virginia General Assembly. He served one term in the United States House of Representatives. His father was a cousin of Alexander Hugh Holmes Stuart. Elizabeth Stuart, his mother, was known as a strictly religious woman with a great love of nature. At the age of 14, James was enrolled at school in Wytheville. He attended Emory & Henry College from 1848 to 1850. He entered the Class of 1854 at the United States Military Academy at West Point, New York. Robert E. Lee was Commandant of the Academy at that time. Stuart graduated 13th in his class of 46 in 1854, and attained the rank of cavalry sergeant, the highest rank attainable for cadets. In 1855, he married Flora Cooke, the daughter of Colonel Philip St. George Cooke, a native Virginian. In 1854, Stuart was assigned to the U.S. Mounted Rifles in Texas. He was soon transferred to, and promoted in, the newly formed 1st Regiment, U.S. Cavalry. Stuart's leadership ability was soon recognized. He was a veteran of Indian conflicts involving tribes such as the Cheyenne and "Bleeding Kansas," which pitted those favoring slavery against local abolitionists. Stuart was wounded in July 1857, while fighting on the frontier against Native Americans. In 1859, Stuart carried the orders for Colonel Robert E. Lee to proceed to Harpers Ferry to crush John Brown's raid on the U.S. Arsenal there. During the siege, Stuart volunteered to be Lee's aide-de-camp, and read the ultimatum to Brown before the final assault against Brown. He was promoted to the rank of captain on April 22, 1861, but resigned from the U.S. Army on May 14, 1861, to join the Confederate States Army, following Virginia's secession from the United States. Cavalry Corps (September 9, 1863–May 11, 1864). After service in the Shenandoah Valley early in the American Civil War, Stuart led his regiment in the First Battle of Bull Run and participated in the pursuit of the routed Federals. He then directed the army's outposts until given command of the cavalry brigade. He established a public reputation for conducting daring reconnaissance raids behind Union lines. Twice he slipped around Maj. Gen. George B. McClellan's army, once in the Peninsula Campaign when he successfully took 1,200 men around McClellan's 105,000 troops over a distance of 100 miles (161 km) and allowed Lee to attack Mechanicsville while keeping the Federals away from Richmond and once after the Battle of Antietam. While these exploits were not militarily significant, they served to improve Southern morale. During the Northern Virginia Campaign, Stuart lost his signature plumed hat and cloak to pursuing Federals, but in a later raid, managed to overrun Union army commander Maj. Gen. John Pope's headquarters and not only re-captured his full uniform, but also intercepted orders that provided Lee with valuable intelligence. At the end of 1862, Stuart led a raid north of the Rappahannock River, inflicting 230 casualties while losing only 27 of his own men. In May 1863, at the Battle of Chancellorsville, Lee appointed Stuart to take command of the Second Corps for a few days after Lt. Gen. Thomas J. "Stonewall" Jackson had been mortally wounded at the Battle of Chancelorsville. Stuart did as well commanding infantry as he did cavalry. Returning to the cavalry, the Gettysburg Campaign represented two low points in Stuart's career. He commanded the Southern horsemen at the Battle of Brandy Station, the largest predominantly cavalry engagement of the war, on June 9, 1863. The battle was a draw and the Confederates held the field. However, falling victim to a surprise attack was an embarrassing blow to a cavalryman and the fight revealed the rising competency of the Union cavalry and foreshadowed the decline of the formerly invincible Southern mounted army as they struggled to hold their ground. As Lee and Union Maj. Gen. George G. Meade marched toward each other at Gettysburg, Lee ordered Stuart to screen the Confederate army as it moved down the Shenandoah Valley and to maintain contact with the lead element, Lt. Gen. Richard S. Ewell's Second Corps, as it advanced in the direction of Harrisburg, Pennsylvania. Stuart once again attempted to circle the Union army and eventually found himself well to the east of Ewell, out of contact with the Union army, and out of communications with Lee. Lee's orders gave Stuart much latitude, and both generals share the blame for the long absence of Stuart's cavalry. Stuart may have been more effective at Gettysburg had he followed Lee's orders more closely. Stuart and his three best brigades were absent from the army during the crucial phase of the approach to Gettysburg and the first two days of battle. Lee's army was left blinded in enemy territory without detailed knowledge of the terrain, roads, or their opponent's strength and positions. This lack of knowledge was a significant reason that the Battle of Gettysburg started on July 1, 1863, before Lee could fully concentrate his army as planned. Stuart arrived at Gettysburg late, on the second day of the battle—bringing with him a caravan of captured Union supply wagons and received a rare rebuke from Lee. No one witnessed the private meeting between Lee and Stuart, but reports circulated at headquarters that Lee's greeting was "abrupt and frosty." Colonel Edward Porter Alexander wrote, "Although Lee said only, 'Well, General, you are here at last,' his manner implied rebuke, and it was so understood by Stuart." On the final day of the battle, Stuart was ordered to engage the enemy's rear echelon and disrupt their line of communications at the same time Pickett's Charge was being conducted against Cemetery Ridge, but his attack on East Cavalry Field was repulsed by Union cavalry under Brigadier Generals David McM. Gregg and George Armstrong Custer. During the Overland Campaign (Lt. Gen. Ulysses S. Grant's drive on Richmond in the spring of 1864), Stuart intercepted Maj. Gen. Philip Sheridan's cavalry at Yellow Tavern on the outskirts of Richmond on May 11. A dismounted Union cavalryman shot him from a distance of thirty feet with a pistol; Stuart died the next day in the Confederate capital. The last words he spoke were in a whisper, "I am resigned; God's will be done." Lee mourned his death, remembering Stuart as one who "never brought me a piece of false information." He was 31 years old. J.E.B. Stuart was buried in Richmond's Hollywood Cemetery. He was survived by his wife, Flora Cooke Stuart, and his children, J.E.B. Stuart Jr., and Virginia Pelham Stuart. Following his death, Flora Stuart wore the black of mourning for the remaining 49 years of her life. Like his close friend, Stonewall Jackson, J.E.B. Stuart was a legendary Confederate figure and is considered one of the great cavalry commanders of America. Stuart was the son-in-law of Brig. Gen. Philip St. George Cooke who served in the Union Army. Upon learning that his father-in-law would serve under the Union banner, Stuart wrote: "He will regret it but once, and that will be continuously." In a war the split families Stuart's brother-in-law was Brig. Gen. John Rogers Cooke served with the Confederacy. A statue of General J.E.B. Stuart by sculptor Frederick Moynihan was dedicated on Richmond's famed Monument Avenue at Stuart Circle in 1907. Like General Stonewall Jackson, his equestrian statue faces north, indicating that he died in the War. The U.S. Army named two models of World War II tanks, the M3 and M5, the Stuart tank in its former adversary's honor. A high school in Falls Church, Virginia, J.E.B. Stuart High School, is also named after him. The school's team nickname, Raiders, honors his Civil War tactics. In December 2006, a personal Confederate battle flag, sewn by Flora Stuart, was sold at auction for a world-record price for any Confederate flag, for $956,000 (including buyer's premium). The 34-inch by 34-inch flag was hand-sewn for Stuart by Flora in 1862 and Stuart carried it into some of his most famous battles. However, in December of that year, it fell from a tent front into a campfire and was damaged. Stuart returned it to his wife with a letter describing the accident and telling of his despondency over the banner's damage. The flag remained with the Stuart family until 1969, when it was given to Stuart Hall, Staunton, Virginia, by a granddaughter of the Confederate general. Flora Cooke Stuart was headmistress of the Virginia Female Institute in Staunton, which was renamed "Stuart Hall" in her honor in 1907. The school quietly sold the flag and letter to a private collector in 2000. In 2006, the flag and letter, which had been displayed in a single frame in the Stuart Hall front parlor, sold separately at auction. Stuart's birthplace, Laurel Hill, located in Patrick County, Virginia, was purchased by the J.E.B. Stuart Birthplace Preservation Trust, Inc., in 1992. Eric Helms Monday founded the Preservation Trust in the late 1980s, to preserve and interpret the birthplace of General Stuart. On the television show, The Dukes of Hazzard, one of the Duke cousins (who only appears in one episode) is named "Jeb Stuart Duke." In the long running Comic Book G.I. Combat, featuring "The Haunted Tank," published by DC Comics from the 1960s through the late 1980s, the ghost of General Stuart guided a tank crew (first a Stuart, later a Sherman) commanded by his namesake "Lt. Jeb Stuart." Joseph Fuqua played Stuart in the films, Gettysburg and Gods and Generals. Errol Flynn played Stuart during the pre-Civil Wars years confronting John Brown in Kansas and Harper's Ferry in the movie, Santa Fe Trail. Several alternate histories, describing scenarios where the Confederacy won the Civil War, gave extensive roles to Jeb Stuart's alternative lives. He is a prominent character in Robert Skimin's Gray Victory and Harry Turtledove's Timeline-191 series. An experimental band, The Jeb Stuart Tribute Band, uses J.E.B. 's name for their band. Their songs include topics that relate to the southern American culture. ↑ John C. Fredriksen, "James Ewell Brown Stuart," in Encyclopedia of the American Civil War: A Political, Social, and Military History, eds. David S. Heidler and Jeanne T. Heidler (New York: W. W. Norton & Company, 2000), 1892. ↑ Stephen W. Sears, Gettysburg (Boston: Houghton Mifflin, 2003) 257-58. Heritage Auction Galleries. The Personal Battle Flag of Confederate General JEB Stuart, The Most Famous Cavalry Officer of the Civil War. General James ... (Total: 1). Retrieved August 14, 2007. Hill, Laurel. Birthplace of General J. E. B Stuart CSA Retrieved August 14, 2007. This page was last modified on 1 May 2018, at 20:52.